My husband has done 10, maybe 11 rounds of P90X, to be honest, I’ve lost count. One of the first investments he made, was a set of PowerBlock P90X Adjustable dumbbells. The second investment was the P90X Chin-Up Bar. Anyway, the PowerBlock set has been the best investment we have made to help us meet our fitness goals. I have used them personally for the ChaLEAN Extreme program, so they’re just not P90X Adjustable Dumbbells, they’re multi-purpose! These are great dumbbells! They are much smaller than SelectTech dumbbells and conventional dumbbells. PowerBlocks are very easy to use, and the best part is that they’re affordable! When I say affordable, they are less expensive per pound than their competitors. The P90X Adjustable Dumbbells are easy to control and balance. Another plus is that PowerBlocks do not inhibit your movements, because they are not as large as regular dumbbells or the SelectTechs. Plus, as you need more weight, you have the option to buy add-on kits that allow you to add more! A few of the models available cannot be modified. There are several series of PowerBlocks available that are made of different materials. They have urethane-coated, aluminum, and professional/commerical gym sets available. There is the Sport series which is a bit more rounded and updated, and the Classic series which is more square in shape. PowerBlock also has many types of stands available that provides a great place to store your weights. We own the Sport Tray with Wings, and it is a great storage item because we are able to store the add-on weights my husband likes to use without having to purchase an additional stand. The P90X Adjustable Dumbbells will last forever. We’ve been using the same set for 7 years! Any of the workout routines that use resistance bands are ideal to use dumbbells as a substitute. I personally prefer the dumbbells, but the resistance bands are great for travel. It’s not feasible to drag your weights along with you on vacation or business trips, the resistance bands are quick and easy. You can just roll them up and store them in your luggage. 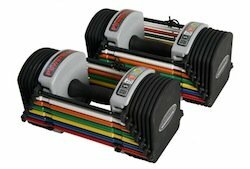 Like I said earlier in this review, PowerBlocks are not as pricey as other types/brands of dumbbells. P90X Adjustable Dumbbells are an investment. The entry level PowerBlocks are $149 plus $35 for shipping and handling. If you don’t have a lot of money to invest early on, or if you’re not sure whether or not you’ll stick with it, resistance bands are probably the equipment of choice for beginners. You can get a set of B-Lines Resistance Bands for less than $50 including shipping and handling. A small price to pay for something that will pay for itself in a few weeks of use! PreviousGet Leaner with these 5 Fats! NextFrozen Yogurt: No No! or Yes! Yes! I love my powerblocks, too! I bought my classic 45 set about 10 years ago, before they offered so many different options. They still look brand new, even though I use them all of the time! And – I was thrilled to find out that they now make an upgrade for my old school set, as well! LOVE LOVE powerblocks!! 🙂 I use platemates for the in between sizes, and the combo of the two is just perfect for me.